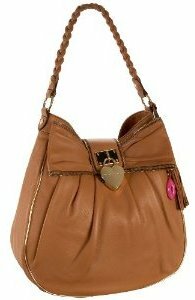 This is just as flamboyant and fun as any Betsey Johnson bag, and in this camel color I love it! I'm less convinced by the lurid pink option, although I'm sure it'll be right up any Barbie girl's alley! What I like most about this design is the composition. The bow is bold to be sure, with zipper trim and a heart-shaped silver padlock. It dwarfs the top of the bucket, but it's balanced by all the blank space near the rounded base. I've often accused Betsey Johnson of over-embellishing her purses, so I'm thrilled with the restraint shown here. While the bow accent is gutsy, the interior is even wilder with its spotted leopard print lining. This animal print masks an interior that's more practical than playful. It's generous in size with pockets to support the expanse. Each one is trimmed in leather to withstand daily punishment, making this Heart of Gold bag a great everyday companion. At $298 this isn't an impulse buy, but its high quality materials and quirky individual style make it worth the splurge. The Betsey Johnson Heart of Gold tote bag, a great alternative to this bucket bag.